From Hellboy #1 ™ & © 1994 Michael Mignola. One of the surprise hits of the 1990s, Hellboy mixed horror, superheroics, and the darkest of humor, spawning a mini-merchandising industry in its wake. Throughout the 1980s and 1990s, creator Mike Mignola was something of a journeyman artist, flitting from title to title and slowly evolving an increasingly dark and expressive style. The emergence of Image Comics prompted Mignola, Art Adams, Frank Miller, and other artists to set up their own imprint, Legend, but not wanting to self-publish, they arranged for Dark Horse to become their distributor, while they retained ownership of their characters and their imprint. Remembering a sketch he had drawn in 1991 of a striking-looking character that he called Hellboy, Mignola developed the concept further, and by 1993 he was ready to be unleashed. Hellboy was first introduced to fans at the 1993 San Diego Comic-Con, in a section of a Dark Horse giveaway comic (aptly called San Diego Con Comics), and was exposed to a wider audience through a guest shot in John Byrne’s Next Men title later that year. 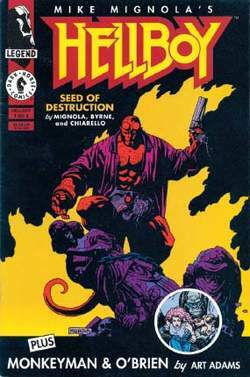 Hooking up with Byrne as scripter, Mignola brought out the first Hellboy comic proper in early 1994, and such was its success that the four-issue miniseries, Hellboy: Seeds of Destruction, has been in print ever since. Hellboy is a large, muscular, red-skinned apparition, half man and half demon, with a tail, horns (which he regularly saws off), and a gigantic, iron-gloved right hand. Much of his background has been left deliberately obscure, but it has been revealed that, during World War II, he was summoned to Earth—as a child—by a cabal of Nazi necromancers, in a ceremony that was broken up by allied troops and mystics. 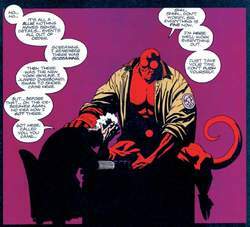 Adopted by a British parapsychologist, who was killed in the first story, Hellboy grew up to be a force for good, and his constant battle against his demonic heritage has been very much a feature of the series. As the comic has progressed, more details of his past have slipped out, including the revelation that he was born to a human mother in hell, and that he is apparently the harbinger of the Apocalypse; this he was not happy to hear. For decades, Hellboy has apparently been a member of an international group of investigators, the Bureau for Paranormal Research and Defense (BPRD), which sends its investigators around the world to research the unknown and the terrifying. Like so many heroes of the 1990s, Hellboy breaks the tradition of the classic superhero, in that he has no alter ego, supercostume, or superheroic trademarks—save for incredible strength, which he metes out on unsuspecting criminals and villains. The first story, spread over four issues, set the tone for the succeeding tales with its collection of monsters, haunted houses, evil magicians (in this case Rasputin), Nazis, and the threat of world destruction. This and other stories co-starred Hellboy’s fellow BPRD members, most notably the pyrokinetic Liz Sherman, Roger the Friendly Homunculus, and Abe Sapien, a scaled amphibian who was originally placed in suspended animation by frightened townsfolk in the nineteenth century. Other episodes have featured werewolves, pig-men, harpies, gorgons, ghosts, giant rats, demons, homunculi (man-made monsters, a la Frankenstein), world-destroying worms, and Nazis by the score. In fact, most of the Hellboy tales appear to involve leftover Nazis of some description or another, whether it be Nazi corpsesreturning from space, disembodied Nazi heads floating around, vampire Nazis, or an endless supply of deformed Nazi scientists. As outré as some of the material is, however, Mignola’s mordant humor and taste for the absurd always make it eminently readable. Mignola has released his tales sparingly in a succession of miniseries, collections, and one-shots, in yarns ranging from a few pages to the epic 1996 five-issue “Wake the Devil” story. In the process of writing the comic solo since 1995, Mignola has grown as a writer and artist, constantly paring his dialogue and art down to a striking minimalism. His Hellboy style is a mass of dark, menacing shapes, with figures rendered in an almost abstract way, and it has inspired many artists in its wake. Mignola always saw the series as an opportunity to combine his two great loves: the atmospheric horror milieu, full of menacing creatures, crumbling castles, and bleak locales, and the power and excitement of superhero comics. An avowed fan of legendary artist Jack Kirby, Mignola fills his strips with enormously muscular beasts engaging Hellboy in vast fight scenes, often reducing all around them to rubble. The comic’s success has led to all manner of tie-ins, crossovers, and merchandise, almost from its inception. Crossovers have included miniseries with Ghost, Batman, Starman, Savage Dragon, and the little-known Pain Killer Jane. Spin-off titles have ranged from several BPRD series to an Abe Sapien one-shot and Hellboy Junior. In addition, noted horror writer Christopher Golden has taken the hero in a new direction with a series of prose novels, illustrated by Mignola: Hellboy: The Lost Army; Hellboy: Odd Jobs; and Hellboy: Bones of Giants. As if all that were not enough, a bewildering amount of merchandise has tempted the devoted fan, including Hellboy caps, prints, games, lighters, calendars, watches, lunch boxes, figures, statues, and tumblers. The first Hellboy live-action feature film, whose screenplay was co-written by Mignola, was released in April 2004. Directed by Guillermo del Toro, the film stars Ron Perlman as the title hero, with Selma Blair as Liz Sherman, John Hurt as Professor Trevor Brittenholm, and Doug Jones as Abe Sapien (whose voice is provided by David Hyde Pierce). Del Toro also directed the 2008 live action sequel, Hellboy: The Golden Army, in which Perlman, Blair, and Jones returned to their roles. There have also been two direct-to-video animated films, Hellboy: Sword of Storms (2006) and Hellboy: Blood and Iron (2007); Perlman, Blair, and Jones provide voices in both, and Hurt voices the Professor in the second. She bought the Right Hand of Doom from the internet. The basic idea of this gameplay is: Armed with a revolver and his Right Hand of Doom, Hellboy punches and smashes his way through various levels with very little in the way of puzzle solving or platforming to distract him.